Beast Presses Pause on Heartbreak in "12:30"
If there’s one thing I can count on from Beast, it’s a good ballad. While I love their share of upbeat\ and fun songs, this group excels in melancholy mid-tempo songs, and “12:30” is no exception. The greatest challenge of promoting with a ballad is maintaining intrigue. The K-pop ballad has been stereotyped for years, especially since there has historically been a lack of creativity and originality in its presentation. Beast has been successful in carving out their own brand of ballad. 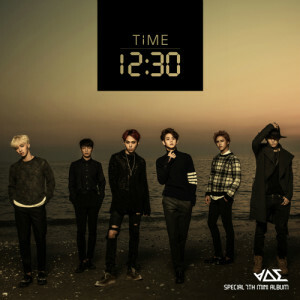 For fans of the band, “12:30” isn’t anything particularly new or special, but it’s a well-crafted ballad that will please those looking for Beast to deliver their usual best in both visuals and audio. The mini-album Time clearly finds its thematic center with this single, but “12:30” focuses upon a relationship that has met its end due to growing emotional distance. The lyrics create a metaphor with the hands of a clock at 12:30, the hour and minute hand are furthest apart just as the couple is at this stage in their relationship. Throughout the video, a large clock creeps closer and closer to 12:30 as the couple’s conflict comes to a confusing end. If one reads the lyrics, most of the imagery of the song has a direct correlation to what the video shows. Of note are the breaking glass that Yoseob references in the opening line and the embrace that Junhyung sings about later on. 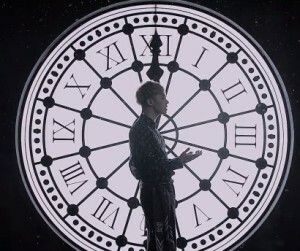 The clock imagery is in full effect between the large clock showcased on the wall of the room and the broken clock locket that Doojoon angsts over at the end. In the video, Doojoon and his girlfriend have come to an impasse where she’s ready to break up despite his protests. Their quiet unhappiness eventually boils over, as Doojoon becomes aggressive in his pleas for her to stay while she lashes out against him, throwing the clock locket to the floor, despite its implied importance to their relationship. This triggers a violent reaction by Doojoon, who grabs her and pushes her to the bed as the glass breaks, just as it had in the foreshadowing of the video’s opening. 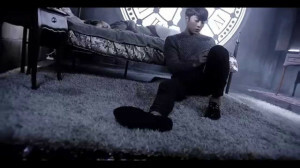 Doojoon forlornly picks up the locket and sits against the bed, grabbing his lifeless girlfriend’s hand. A chair burns. 12:30 passes by abnormally fast. The way that the final scene was played made it very difficult to interpret what I was supposed to see. Why was the girlfriend so still at the end? Did time stop on her, freezing her to the bed? Did Doojoon’s aggressive rage shock her to death? The end offers no clear solution. The locket’s state, however, is more concrete. The small watch’s time froze on 12:30 with intent: the couple will never be close again due to the symbolic distance of the clock’s hands. The big clock could be considered more objective. Although the couple has had this tragic end, the time existing outside of them still ticks forward with no sympathy. We’ve seen many videos play with the idea of time (Wheesung’s “Night and Day” and Sunmi’s “24 Hours” come to mind), and the themes are typically heavy-handed. I was only moderately interested by the video’s plot, but I was very intrigued by the choreography. One area that ballads typically fail in is dancing, so I was pleased to see that there were some interesting dance steps for “12:30.” I only wish that I could have seen more — the dance scenes were very disjointed from the plot’s scenes when they popped up in the last third of the video. I especially liked that they included the “12:30” imagery with their arms without it looking too silly or forced. Some of the choreography looked inspired by ballet and provided a delicate air to a song that warrants it. Power moves don’t suit ballads, but dancing can go much further than what’s typical for boyband ballad choreography, and it’s nice to see some slight variation with Beast. The vocals of this song are also great, giving all of the members some space to show off a little. “12:30” does feel emotional and that’s mostly due to the vocal performances of the members. The vocal distribution on the bridge is very smooth and pleasant, and both Kikwang and Dongwoon shine on their parts. Beast also gets credit for production. The instrumentals of their ballads always sound beautiful, but I particularly loved the use of strings in this song. It adds an elegance to the somber mood that really works for the visuals. Overall, “12:30” is just okay. Beast has certainly done better, and after their great comeback with “Good Luck” earlier this year, this single doesn’t feel too remarkable. It’s another well-produced, well-performed ballad by Beast, but the video suffers for being perhaps too predictable in its method and execution. Nonetheless, the song and video both have the elegance and sophistication that I’m used to with Beast.